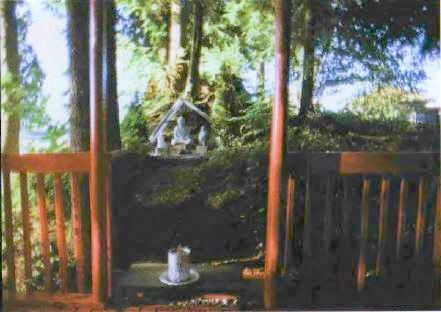 Former inmates of Ferndale Minimum Security Institution in Canada, Segen Speer-Senner and Gareth Robinson (Miki & Robbie,) have created a peaceful garden and shrine in the prison grounds, beside a small stream and just across from the American Indian spiritual grounds. Deer, bears and small mammals visit the area – and occasionally chew the vegetation. Statues of Guru Shakyamuni Buddha, Avalokiteshvara in the aspect of Kwan-Yin Bodhisattva and Maitreya Buddha have been placed in the shrine. The project has been generously supported by prison administration. One prisoner, who is now back out in the community, built the platform and used it after working hours to do many hours of Vajrasattva recitations. Buddhist and non-Buddhist inmates helped Miki and Robbie to erect a shelter and translucent roof on the platform. Bright paint makes the belvedere clearly visible from a distance, and prayer flags abound. Reg Dyck, a devout Mennonite at the Ferndale Horticultural Department, who supervised the men’s gardening, gave advice and generously donated trees, perennials, flowers and labor. A footpath of about eighty-eight paces allows one to circumambulate the holy statues and the gardens.